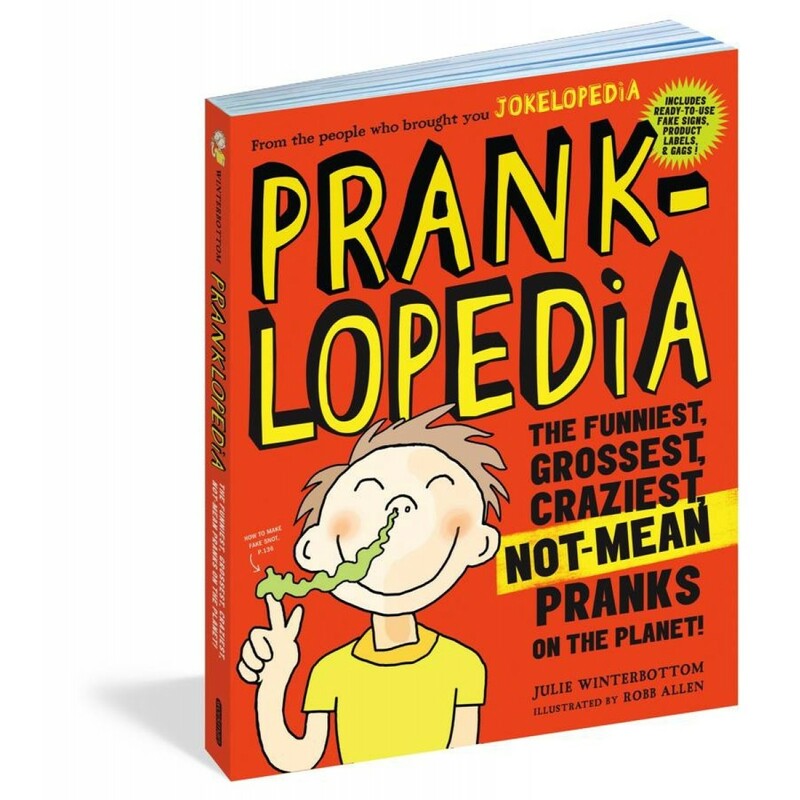 Pranklopedia is the young practical joker’s secret weapon, a boisterous collection of over 70 guaranteed-to-amuse (or annoy) pranks to be pulled on friends, siblings, and parents. Discover the Homework Hoax, the Squirting Blister, the Movie Popcorn That Grabs You Back. Pull classic pranks on your siblings, like short-sheeting the bed. Freak out your friends with food pranks: a self-peeling banana, “misfortune” cookies, or ice cream that will make them scream (here’s a hint—it involves instant mashed potatoes). And there are perfect pranks to pull on your parents, including a scheme to “freeze” the family computer! Everything is in there for any lovable rogue looking for some mischief - including recipes for fake bird poop, fake dog poop, fake vomit, and fake snot (regular, nosebleed, and wormy varieties). It's interactive - the books includes lots of cutout pranks, including fake labels (mmm…Cream of Sparrow Soup! ), a “winning” lottery ticket, bogus bathroom signs, and letters from school that will make parents cringe. Pranklopedia also provides a four-part lesson on how to pull the perfect prank and tells you what to do when pranks go bad (how about disappear for a while) . . .
Includes ready-to-use fake signs, product labels and gags!